I was driving to the computer store to pick-up some iPads for Lincoln Lutheran students, when traffic came to a stand still. I was right at an intersection, so I thought I would just make a little jog to bypass whatever craziness was taking place ahead of me. They are clearly working on their preparations for the Zombie Apocalypse, and who can blame them. I was impressed with their efforts thus far. They are not yet completely around the house, but the stack is about 6 feet thick, so you could walk around on the top and pick zombies off without being in any danger of falling off the wall. Also, I may have been playing too many zombie games this summer. Also, there have been other posts about zombies. 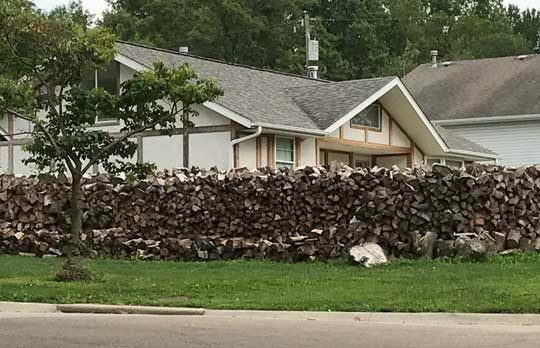 Is that a giant stack of free heat surrounding their house? I’ve wondered about doing such a thing… heating a house with a wood burning stove. If you had the right setup, it seems like it might work well. Wow! That took a while. Wood furnace works better. Ask Lloyd he picked up many a load of wood. He has Terminix… His neighbors are screwed.